Police in Italy have arrested four alleged mafia gangsters over a Christmas extortion scam. 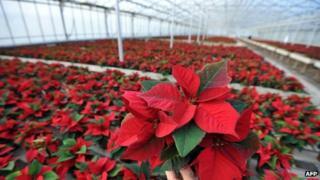 The men have been forcing shop owners to buy poinsettias - red-leaved plants known in Italy as Christmas Stars - for 100 times the wholesale price. The gangsters in the southern city of Naples have been demanding as much as 100 euros (£85; $140) a plant for the past three festive seasons, police say. Owners who refused the mob's "Christmas offer" had their shops vandalised. "It wasn't someone dressed like Santa Claus tapping on the doors of shop owners and businesses... Instead there were four emissaries of the Mazzarella clan," police said. The men were trying to raise funds for the families and legal fees of jailed gang members, police said. The BBC's Alan Johnston in Rome says mafiosi extortion rackets are the curse of business life in much of southern Italy.